Solar installation is a standardized procedure that can be carried out efficiently by a team of experienced solar professionals. They install the benefits of solar power to residences like yours every day. You’ll start saving money from day one and, eventually, the savings will pay for the cost of your system. Preparing for solar installation poses a few issues to think about, however. 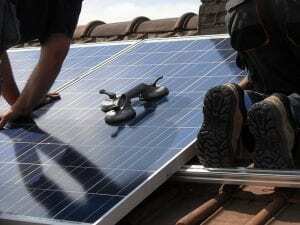 While none present obstacles that can’t be overcome, it pays to be aware of certain prerequisites to a solar installation before the time comes. How’s your roof exposure? Ideally, an expanse of south-facing roof space provides the most favorable setting for installing solar panels. This ensures maximum exposure to direct sunlight for the most hours of the day. However, direction isn’t as critical as many people assume. If your roof’s not on a direct compass line to the south, solar panels can be aimed to compensate for most directional variations and still harvest sufficient sufficient sun power. Is shade an issue? If trees or overhanging limbs shade your roof, they may require trimming to keep the roof open to sunlight as many hours a day as possible. Remember that the path of the sun changes with the hour of the day and so does the extend of shadows. It’s a good idea to check the roof at various times to see if shade affects solar exposure. Are their any obstructions? Certain common roof features may need to be relocated to make room for solar panels. These include vent pipes, satellite dishes and other objects. Most can be readily resolved, however, some features like skylights may present a more complicated hindrance. Your contractor can advise you on options. Does your roof need repair? If you’ve putting off dealing with any pending issues like roof leaks, deteriorated shingles or other matters that require repair, now’s the time to get that work done. Your roof should be in optimum condition before the solar installation begins. Rely on the professionals at Rinaldi’s Energy Solutions for accurate, straightforward answers to all your questions about a solar installation at your home.